Capture your unique business data by storing it in Custom Fields. Custom Fields are part of Settings in the Admin Portal, they allow you to store additional data in relation to Achievements, Events, Forms, Libraries, Media, Messages, Quizzes, Registration Portals, and Users. Custom Fields act as additional fields that can be used for categorizing content, adding additional search terms or assigning custom data to users. Custom fields associated to user data can also be used to create form smart groups. In Settings, choose the Custom Fields tab. Click on +New Custom Field button. 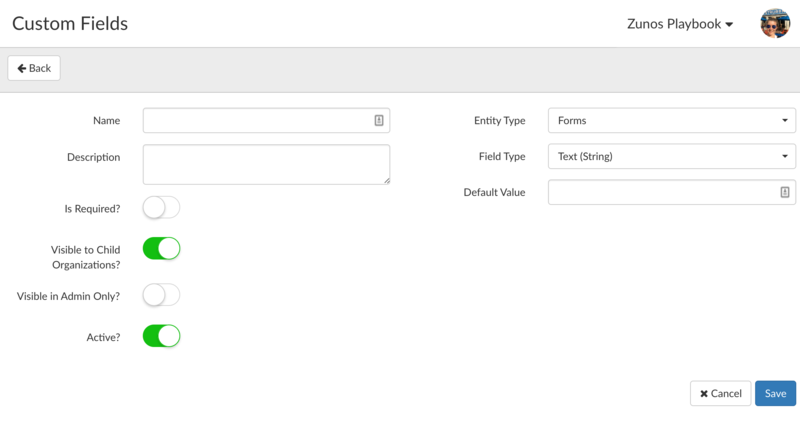 This will open the Custom Fields creator. Name Enter the name of the custom field you wish to create and display in achievement settings. Description Additional information describing the property of your custom field tag. Is Required? If enabled, the listed field in settings of content under Custom Fields will become mandatory to fill when adding new content in drive or creating new users. Visible to child organizations? If enabled in a parent in Parent-Child hierarchy, all children of that parent will be able to see and utilize the custom fields. Visible to Admin Only? If enabled only administrators will be able to view and search by this field via the Admin Portal. If not, users will be able to search these fields via the app. Active If enabled, places the Custom Field in a visible state for administrators to see when using the Zunos Admin portal. Make sure Custom Fields are set to active or they won’t display in the relevant area within the Zunos Admin portal. Entity Type The Entity Type determines which area of Zunos the Custom Field will apply to. For example, if Achievement is selected as Entity Type custom fields would only be visible and relevant in the Achievement Settings area. List Values This field will appear when the Field Type is set to a List. Here you can add multiple pre-defined values to select from when using this custom field. You can also set a Default Value, allowing custom fields to be pre-populated with a default value. You can apply the created Custom Fields in new or existing media, forms, quizzes, achievements, and users. From Drive select a content item, eg a quiz, form, achievement or media item. When editing settings of the content, the additional Custom Fields will appear at the bottom of settings. Update the fields as required. From Users, select a user. The Custom Fields section appears beneath the users' details. Update the Custom Fields as required.